This might just be the easiest and fastest electric knife sharpener I have ever used. I can get some of the best results in less than a minute and without making any efforts. The technique isn’t complicated at all, you simply hold the knife at a level angle and alternate between the two slots of the level one for a while and repeat the process for level two and three. In My Chef’s Choice Trizor XV Review, I have described Step by step Guide. Among electric knife makers, Chef’s Choice is by far the most popular, and many their models place high in both user reviews and comparative professional tests. Chef’s Choice Trizor XV is the answer for folks who want a quick way to get a razor sharp edge on their kitchen knives. I have had mine for just three months, and it’s the best item I’ve bought. I have used all knife sharpening techniques available. From Japanese water stones to carbide sharpeners to fixed angle sharpeners. This unit from Chef’s Choice superseded my expectations. It brought to life all my knives and even the serrated knives and cleaver. It does a nice job of putting a razor sharp edge on your knife in no time. If you don’t have patience for conventional sharpening stones, this is the answer you’ve been searching for. If you are searching for a sharpener that will put a wicked sharp edge on your blades, the Trizor will sure do the trick. It is a very capable product with a three-stage sharpener that will work with both Japanese and western knives. It’s a practical and versatile add-on to your workspace, and getting one means you can stop thinking about blunt blades! The Trizor XV Sharpener contains one hundred percent diamond flexible stropping abrasives to ensure a correctly sharpened blade. You can use it on a different of products like the serrated knives, Asian styled sushi knives, American and European American household knives, sport/pocket knives. The Trizor helps lengthen the useful life of your knives since it produces a fifteen degrees triple-bevel arch-shaped edge that withstands dulling longer than traditionally sharpened V-shaped or hollow-ground edges. What I like about this Sharpener is that your knives are sharpened at the same angle each and every time, making re-sharpening so quick you will never have to work with a blunt knife again. Interesting enough, this knife sharpener has preset sharpening angles to provide guaranteed results. The Trizor is incredibly simple to use and for anyone who wants a quick and effective method of putting a razor sharp edge on their blades. Be it an American, European, or Asian knife it will sharpen the edge to flawlessness. Crazily enough, even an armature will find it easy to use. This user-friendly knife sharpener, with unlimited innovative features, gives new meaning to the definition of sharp. It comes with a lifetime limited warranty that covers consumer use only, and not commercial or industrial use. This means you can have a peace of mind knowing that the company has you covered in case something isn’t right with your tool. Although the Chef’s Choice Trizor XV is a bit expensive compared to the standard Chef’s Choice edition, you get a stronger motor, adjustable speed, and a greater range of angle adjustment. Being a belt-based system, the edge produced when knives are sharpened will be the way knives come from the factory. 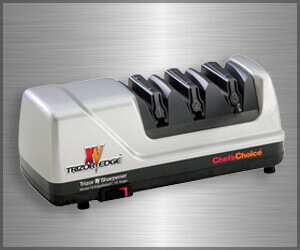 Let’s face it, the Chef’s Choice Trizor XV Sharpener is quite expensive but at the same time saves your precious time. I have mentioned that since I have personally used and found that it is one of the fastest ways to get your edged tools as sharp as you need them to be. Admittedly, The Trizor tops the list of the best electric knife sharpener class. It is gentle on your expensive knives, hence prolonging the useful life of your blades. Comes equipped with flexible spring guides, which auto-adjust the honing angle properly. The Trizor Sharpens American, European and Asian knives, including straight and serrated edge knives. A: Yes, it will. Its special diamond abrasives can sharpen any ceramic knife. Chef’s Choice really does make home sharpening possible and easy. Like I mentioned earlier, I have tried many different types of sharpening techniques, from steels to stone, manual to electric and nothing beats the Chef’s Choice Trizor XV review. With the Chef’s Choice Trizor XV, you can literally restore a factory edge to your knives in minutes. 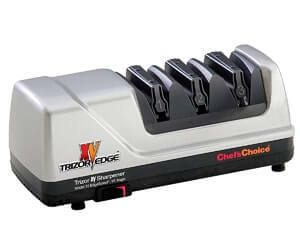 I would definitely recommend the Chef’s Choice Trizor XV Sharpener to any chef. Not only will they get a great sharpener, but the features are also amazing. The quality and durability of the product are second to none.